What with all this new interest in the upcoming Marvel Comics Universe reboot, I thought I'd dig up this old article I wrote up on The Bendis Board (now defunct) back in 2008. It won me an official No-Prize from Tom Brevoort who posted it in his blog at the time. I was catching up on Uncanny X-Men today, hoping Ed Brubaker had meant when Sam Guthrie said he was 21 years old in a bar that he'd meant he was OVER 21. Yeah, I'm persnickety about The New Mutants and always have been. When the character debuted in 1982 in the Graphic Novel 'The New Mutants', he was 16 years old and working in a coal mine. The character of Kitty Pryde was introduced in 1980, and was described at the time as being 13 and a half. She was also described as being 14 in 1983 when The New Mutants got their own ongoing title. So far this is all stuff you already know. I WILL get to the point. My own take on it was that if Kitty Pryde was 21 years old at the time of her alleged termination (Yeah, we'll see how long THAT lasts. ), then she's taken 28 reader years to age 8 character years. Breaking that down, (and ignoring the fact that there's been a Christmas issue every year in Marvel Comics since 1980), that would mean she's aged one character year for every 3.5 reader years. 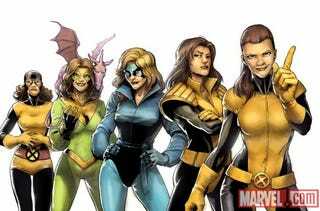 As well, everyone who was IN the X-Books since then should have aged at least 8 years since Kitty Pryde was introduced in 1980. I'm calling it 'The Pryde Scale' for easy future reference. 28 reader years. With a Christmas issue every year. I don't care how ya slice it, that's a lot of Hanukkah candles. But we'll forgive this. If she'd aged a year for every reader year, that would have made Joss Whedon's favorite little Shadowcat a whole 41 years old. Dem mutants do be agin' slow, Miss Daisy. Might as well be walkin'. As Kitty Pryde is/was at least 21 nowadays, Sam Guthrie should be at least 23. Here's a note for Peter David as well. Rahne Sinclair is old enough to have a beer now. Kitty was serving alcohol in Chicago in MekaniX (2002-2003), which you have to be at least 18 by law in Illinois to do. On the Pryde Scale, Kitty was 19 years old then. Kitty was only a year older than Rahne, who was 13 back in 1983. So if Kitty was/is 21 when she caught the big bullet train out, then Rahne should be 20 years old. One also hopes that when Kitty was sleeping around with Pete Wisdom back in her time with Excalibur that he waited to do that with her til after about the middle of 1997. Unless of course Pete Wisdom was having relations with a minor. Of course, the Pryde & Wisdom mini happened in late 1996, and Kitty was talking about how it was likely that her mom might shoot Pete on sight when she introduced the chain smoking cradle-robber to her family. Lucky for him the age of consent in the UK is 16 years old. Let's take this a step further shall we? Since I'm having fun at Marvel's chronological expense. Emma Frost has gone on record as saying that she's 27 back in Grant Morrison's 'New X-Men' in 2003. On the Pryde scale, this would mean mean she's 29 going on 30 today. This also means that back in 1980, when she took on the Phoenix masquerading as Jean Gray in her Phoenix Saga debut, she was a whole 21 years old. Also, Cyclops said he was 25 back in X-Men #51 (1996). Whee! More dates to work with! Kitty was 17 then. (Bad Wisdom! Hot Knife Hands off the Loli!) Meaning Scott was ALSO 21 like Emma was in 1980 when Kitty was 13. How nice. He and Emma are the same age! And of course, what age rant would be complete without poking a little fun at Franklin Richards? Incomplete! That's what! Franklin appears ALLLL the way back in 1968. And was not named until 1970 according to his wiki page. Okiedokie. Let's see what his proper age is on the Pryde scale. Little Franklin has been around for 40 years! 40 / 3.5 = 11.4. So he should be eleven & a half on the Pryde Scale. So... Franklin's depiction as a little boy all this time really isn't really all that off the mark if his aging is consistent with that of Kitty Pryde. 2008 - 1963 = 45 reader years. Current Age = 34 - 12 = Introductory Age of 22 in 1963. And if Scott is 5 years younger than Hank now (29 going on 30 with Emma) that means Slim was 17 all the way back in 1963 when Jean was wearing poodle skirts and Cyclops had all the physique of a wire hanger. FUN! Yeah. I suppose I'm easily amused. And I admit that I have way too much time on my hands. Character aging is an old bone I gnaw on from time to time, and being a Kitty Fan, with dates where they've mentioned her age from time to time, it's something to practice my geek-fu on. I hope this helps. Or at least finds you well.